Citation Information: JCI Insight. 2017;2(9):e93474. https://doi.org/10.1172/jci.insight.93474. Development of antiviral therapy against acute viral diseases, such as dengue virus (DENV), suffers from the narrow window of viral load detection in serum during onset and clearance of infection and fever. We explored a biomarker approach using 18F-fluorodeoxyglucose (18F-FDG) PET in established mouse models for primary and antibody-dependent enhancement infection with DENV. 18F-FDG uptake was most prominent in the intestines and correlated with increased virus load and proinflammatory cytokines. Furthermore, a significant temporal trend in 18F-FDG uptake was seen in intestines and selected tissues over the time course of infection. Notably, 18F-FDG uptake and visualization by PET robustly differentiated treatment-naive groups from drug-treated groups as well as nonlethal from lethal infections with a clinical strain of DENV2. Thus, 18F-FDG may serve as a novel DENV infection–associated inflammation biomarker for assessing treatment response during therapeutic intervention trials. 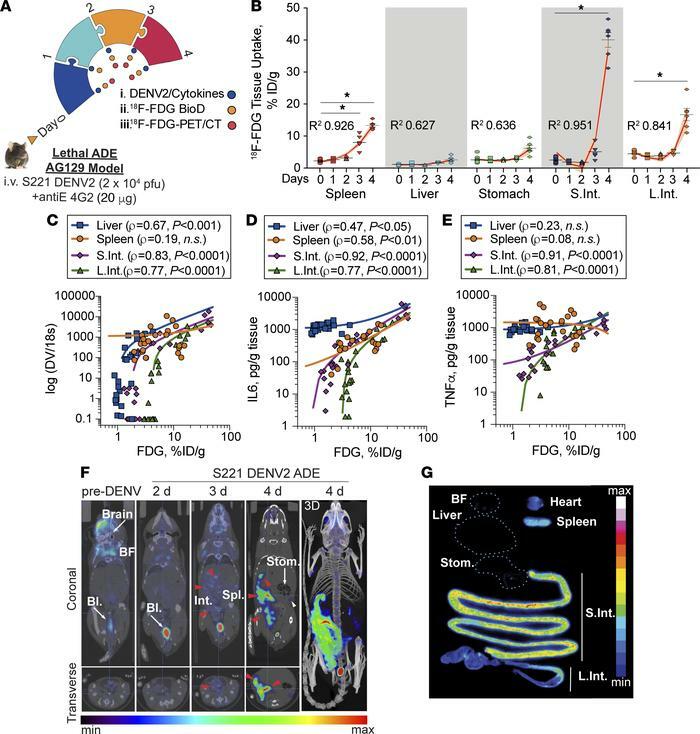 Serial 18F-FDG tissue analysis and PET/CT imaging to understand dynamic evolution of inflammatory foci in lethal mouse-adapted S221 DENV2 model. (A) Schematic representation of induction of mouse-adapted S221 DENV2 lethal immune complex infection at day 0, and timing of biomarker measurements (DENV2/cytokines, postmortem 18F-FDG tissue biodistribution [BioD], and 18F-FDG-PET/CT) over course of disease in female AG129 mice. (B) Terminal 18F-FDG biodistribution in selected tissues plotted over time. Circles, squares, triangles, inverted triangles, and diamonds represent individual tissue uptake at days 0, 1, 2, 3, and 4, respectively (n = 6–12 mice/group). For spleen and small and large intestine (S.Int. and L.Int., respectively), significant 18F-FDG uptake was observed relative to naive mice (as represented at t = 0 day). Mean 18F-FDG uptake was compared by 2-way ANOVA with multiple comparisons; *P < 0.001. Fractional polynomial regression curves, estimated from second- or first-order fractional polynomial regression models, are shown for the nonlinear time course of 18F-FDG uptake following disease progression. Beige shading indicates the 95% CI around the fitted line in red, with R2 values shown. Regression curves were plotted in STATA. (C–E) Tissue biodistribution of 18F-FDG uptake (%ID/g) plotted against paired values for concentrations of (C) DENV, (D) IL-6, and (E) TNF-α levels in mice after infection. Points represent individual tissues (n = 96 mice) from mice with active disease in the spleen (orange), liver (blue), S.Int. (purple), L.Int. (green); n = 24 mice/tissue respectively. A linear regression model of terminal 18F-FDG uptake versus other biomarkers is shown for selected tissues, and Spearman’s ρ and P values are shown. (F) 18F-FDG-PET/CT images of progressing inflammatory lesions following i.v. 18F-FDG administration (representative data shown from 1 animal of a cohort of n = 3). The images show increasing uptake in spleen (Spl.) and intestines (Int.) over time (white and red arrowheads, respectively). Brown fat (BF), bladder (Bl.) CT images show substantial gaseous accumulation within the stomach (Stom.). (G) Ex vivo autoradiography of whole tissue mounts immediately following the day 4 18F-FDG-PET/CT of same mouse as in F, with the highest uptake observed in the S.Int. and lower uptake observed in the L.Int., spleen, and heart. No appreciable 18F-FDG signal was observed in the Stom., liver, and BF. Dotted lines represent the boundaries of the tissues with no discernible uptake (representative data shown from 1 animal of a cohort of n = 4).